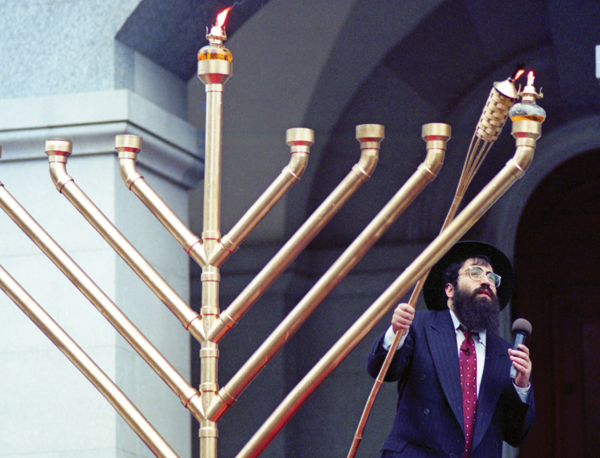 The state capitol’s 11-foot-tall menorah made its first appearance on Nov. 27, 1994. In this Sacramento Bee photo from that year, Chabad of Sacramento’s Rabbi Mendy Cohen marks the beginning of Hanukkah by lighting the first candle. While not everyone agrees that it’s appropriate to display the menorah on public grounds, those who do might be interested in attending this year’s menorah lighting on Dec. 5 at 5:30 p.m.
Photo courtesy of Center for Sacramento History, Sacramento Bee Collection, Randy Pench 11/27/1994. Next articleWould You Like Pancakes with Your Ballot?